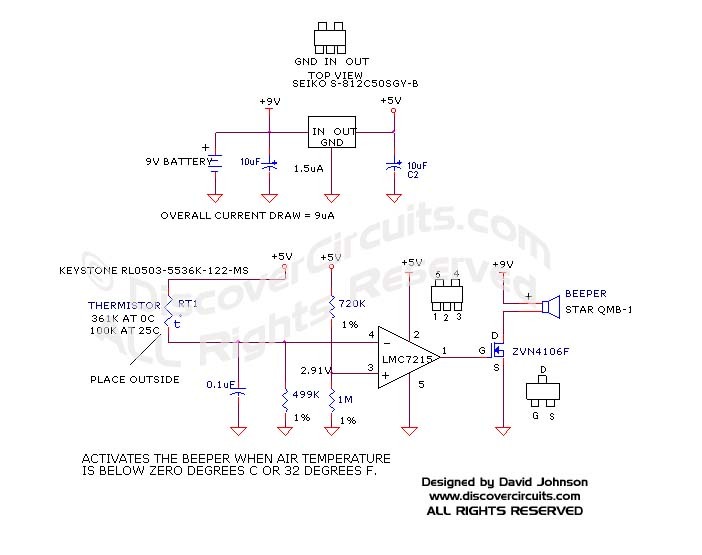 This electronic hobby circuit below is designed to activate a beeper alarm, whenever the outside air temperature is below 0 degrees C (32F). A 9v battery powers the hobby circuit. The average 9ua current is so low that the battery should last for many years. An accurate glass bead thermistor is used as the temperature sensor. Other sensors may have been possible, but by using a thermistor, the overall power consumption can be kept low. A small gage unshielded cable can be used to link the temperature sensor to the hobby circuit. The cable length can be up to 20 feet for a small gage wire and longer if you use a heavy gage wire. The electronic circuit can be housed in a small plastic box. Some boxes have nice snap out compartments for a 9v battery. A very low power +5v regulator is used to provide a solid +5v for most of the circuit. A single low power voltage comparator (LM7215) from National Semiconductor is used to compare the voltages across a bridge network, consisting of the thermistor and a 499K resistor on one side and a 720K and a 1M resistor on the other side. When the temperature is below freezing, the voltage at the non-inverting input exceeds the inverting input, causing the output of the comparator to swing from zero volts to +5v. The 5v signal at the gate of the FET then turns on the transistor, which turns on the beeper.